Itâ€™s summer and it’s been a tedious time since the XP SP3 debacle. There is no doubt, the old OS could use some mending. Mine sure did. Let’s schedule a little spa time. Put her on the rack and get out the gunk. Youâ€™ll be amazed at the way she handles after some TLC. I suggest starting with â€œ1â€ and working straight through. Some of the items are tweaks to increase speed and performance. They may limit or change functionality, so do only the ones youâ€™re comfortable with. I just finished doing every one on my machine. You can view my OverDrive results below. Be sure to wear your safety glasses. 1. Remove Unused Programs. Start/ Control Panel/ Add Remove Programs/ Remove/ Yes. If you are not using a program then get rid of it. If you donâ€™t know what it is, enter it in Google and find out. 3. Clear Browser Cookies And Files. Internet Explorer, Open Internet Explorer/ Tools/ Options/ General/ Delete Cookies, files, Clear History. Firefox, Open Firefox/ Tools/ Privacy/ Check, Accept cookies/ Keep Until I close Foxfire/ Check, Always clear my private data when I close Firefox. To make short work of all cookies, browsing history, and downloads, use a program like â€œEraseâ€ to assure there will be no traceable information left behind. 4. Remove Temporary Files. Start/ All Programs/ Accessories/ System Tools/ Disk Cleanup/Check all items/ OK/ Yes. If you have more than one drive connected, be sure to run the Disk Cleanup for it also. 5. Use a registry cleaner. Although the PC Pitstop Optimize program will clean some files from your registry it is also a strong Optimization program and not strictly a registry cleaner. Right now whatâ€™s needed is a thorough cleaning. There are many registry cleaners and none of them get all of the broken registry files. That can be a good thing because if you use a program that removes needed files you will be in trouble. One program that Iâ€™ve used for a long time with no problems is RegScrubXP. Another good thing about this program is that itâ€™s free. Give it a whirl. 6. Remove Unused Windows Components. Start/ Control Panel/ Add Remove Programs/ Add Remove Windows Components/ uncheck the box of what you want removed/Next/ OK. Just like old programs, there are XP components that most people never use. For me I never use Indexing or MSN Explorer. 7. Defrag your hard drives. Even if all you use is the default Windows defrag program, defrag your hard drive. Start/ All Programs/ Accessories/ System Tools/ Disk Defragmenter/ Defrag/ OK. Whether Windows thinks you need to defrag has nothing to do with it. Itâ€™s always a good idea to defrag after installing and uninstalling programs, applications, and games. If you want to not only defrag your drives but set them to operate at maximum efficiency, then use the Disk MD program. Disk MD will defrag your hard drives and configure the files for easy access. 8. Update all your drivers from the manufacturers site. Sometimes this can be an easy task, but mostly it requires some searching to find the correct driver. Because all hardware is different, I canâ€™t direct you from here. What I can do is direct you to Driver Alert. Download the free scan to see a list of drivers that need updating. If you decide to buy the program it will direct you to the correct download location. 9. Clean out your Start-up programs using msconfig..Start/run/type â€œmsconfigâ€ without the quotes/startup/uncheck any program that does not need to start with Windows/Apply/OK/Reboot. This will remove the resource wasters that open each time you boot Windows. Do not use msconfig to turn off system processes and services. 10. Modify System Restore. Start/Help and Support/Undo Changes/System Restore Settings/Turn off System Restore/OK. If you are going for the fastest system you can achieve, just turn System Restore off. I do. If you are wanting to keep it as a backup safety feature then at least reduce the amount of space that is being set aside for this feature. PC Pitstop has suggested reducing this waste of expensive hard drive space for some time now. I suggest something in the 1300MB to 1500MB range. The % this represents will vary with the size of your hard drive. Start/Help and Support/Undo Changes/System Restore Settings/Disk Space Usage/Move the slider to correct position/OK. Keep in mind that while I donâ€™t use System Restore, I do use Acronis True Image Home for creating backups. Itâ€™s as easy as clicking â€œCloneâ€. I create new clones at least every week. 11. Delete your old Emails. Start/Outlook Express (or email client)/Inbox/Inbox/Delete all unwanted emails/Deleted items/Right click each deleted item/Delete them permanently. Emails can waste space at an alarming rate. If you donâ€™t need them, get rid of them. 12. Increase your Internet bandwidth. This manual adjustment changes the TCP Receive Window size and is recommended only for cable modem or DSL users running XP or Windows 2000. Warning! Incorrectly editing the registry can cause your system to become unbootable. Back up any valuable data before changing the registry. If this suggestion scares you then I suggest using Optimize to safely make the changes for you. Click in the Open dropdown box and type in regedit.exe then click OK.
Back up your registry by selecting File | Export type in a meaningful file name, in the export range section select All and save to your hard drive. To restore your old registry you simply import this file. Next create a new registry key. On the left side, go to the directory HKEY_LOCAL_MACHINESYSTEMCurrentControlSetServicesTcpipParameters. Select Edit | New | DWORD Value. Rename the new registry key to TcpWindowSize. Modify the registry setting for TcpWindowSize by double clicking on the key. Change the Base Setting to Decimal. Enter the value 64240 and click OK, then exit RegEdit. your open applications and reboot your system. 14. Remove Remote Desktop. Start/ Control Panel/ Performance and Maintenance/ System/Remote Tab/Uncheck â€œRemote Assistance and Desktop Sharingâ€/ OK. This is a security risk so I remove it for safety. This feature is not available in XP Home but is available in XP Pro. If I do decide to share my desktop with someone, itâ€™s no trouble to go back and check the boxes. 15. Stop unwanted Services. Start/Run/type â€œservices.mscâ€ without the quotes/double click the service/Stop/from the startup drop down choose â€œManualâ€ or Disable/OK. The drill is always the same but what you choose is up to you. Iâ€™ll give you my suggestions, which are relatively conservative. Do not stop or disable a service unless you know what it does. 16. Adjust for Best Performance or Remove Themes. Start/ Control Panel/ Performance and Maintenance/ System/ Advanced Tab/ Under Performance select Settings/ Visual Effects Tab/ Adjust for best performance/ OK.
17. Adjust your font characteristics. This is a must for LCD users and especially important if youâ€™ve just completed tweak #16. Right click the desktop/ Properties/ Appearance/ Effects/Click â€œuse the following method to smooth edges..â€/ Click the drop down/ Choose â€œClear Typeâ€/ OK/ OK.
18. Adjust the Paging File. Start/ Control Panel/ System/ Advanced/ Performance Settings/ Advanced/ Virtual Memory/ Change/ Custom Size/ 2048 initial size/ 2048 Maximum size/ Set/ OK/ OK. For those with a minimum of 512MB of system memory this should be a safe setting. Because I have 2GB of memory, I set my system to No Page File. There are programs that require more than that amount of physical memory, but I donâ€™t use them. Most gurus, not all, consider 1 GB of memory enough to operate without a pagefile. Itâ€™s your decision and easily corrected if it doesnâ€™t work for you. Simply return to the Advanced Performance section and put a dot in the â€œSystem managed sizeâ€. 19. Reset your Internet Explorer Security and Privacy settings. I actually do this about once a month. Because of testing and work, I might change my security settings several times in a month. To keep myself on track I like to start from the beginning every once in a while. Open Internet Explorer/Tools/Internet Options/Security and Privacy/check to see that the Default Level is chosen. Check the Block pop-ups box while you are there. 20. Absolutely use a backup program.. Plug in your external drive/open your Acronis program/click clone/reboot/unplug drive. Whether you use your computer for work or for communicating with friends and family, no one wants to lose their files and information. In order to feel absolutely safe I use a backup program. Acronis TrueImage Home does the job for me especially because it has a â€œClone Diskâ€ feature. Windows System Restore is no help if your computer wonâ€™t boot. 21. Use a spyware detection program. Exterminate, AdAware, and Spybot, are all good programs for detecting and removing spyware, get one, use it. Click the exterminate link above. The scan is free. If it finds spyware, you can purchase the product and remove the intruder. Itâ€™s as simple as that. Spyware has replaced virus infection as the most prevalent danger today. Donâ€™t let it jeopardize your information and crash your system. 22. Cultivate safe computing habits. You cannot go to Bearshare or Limewire and expect to stay malware free. Learn what sites to avoid and avoid them like the plague. There is no use acting surprised at contracting a virus when you are downloading illegal music or visiting questionable sites. Never click a popup that says â€œYour Infectedâ€¦Click here to remove this threatâ€ That will guarantee that you are infected. 23. Use a virus scanner. I agonize over this area every time I write about it. Iâ€™m always torn between what I do personally and what I consider responsible as a suggestion to others. I do not use an antivirus. Never have and most likely never will. There are many people that absolutely must have an antivirus installed due to their computing habits. For them I suggest Avast Antivirus. Any AV program is only as good as its updated definitions (Virus Lists) and Avast is right on top of it. I did use Avast to remove the only virus I ever had. This virus was installed intentionally for a project. It wasnâ€™t hard to get, I just downloaded it and then installed it. E-mail and downloading/installing infected programs is the usual cause of all malware problems. Iâ€™ve mentioned many times that UAC, AntiVirus, and Spyware programs, are really only protecting you from yourself. So my suggestion is this, Use an online virus scanner. TrendMicro has an excellent online scan As an alternative to the online scan you may download “Avast 4 Home”, their Freeware program. Avast can be set to give you verbal warnings and it’s a dream to use. 24. Do check your process files.. Any company concerned with protecting your computer will have a process library that checks files for safety. You can check any file you come across using our free Process Library. A check of all the processes on your system is performed each and every time you run our PC Pitstop Overdrive scan. OverDrive is also FREE. Run it. 25. Use “chkdsk” to scan and repair your hard drive. Start/ Run/ type “chkdsk” without the quotes/ OK. This process will find any errors on your disk and repair them automatically. Hope you find the suggestions helpful. I was going to suggest the #1 tweak should be “Don’t install XP SP3” but decided against that. If I could only suggest one tweak, it would be, Use the PC Pitstop OverDrive Scan: Absolutely the best free performances scan available today. The information, tips and suggestions will help all areas of your systems performance, whether itâ€™s cleaning, tweaking, or safety. I use OverDrive on every system that comes into my place. How can you go wrong when itâ€™s free? 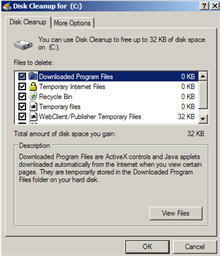 The Pit Blog disk cleanup, files internet explorer, internet explorer tools, open internet explorer, trash files. permalink. An alternative to a program designed for pagefile defrag is to remove the pagefile, reboot, defrag and then create a new pagefile. i am reinstalling windows xp and my screen is stuck at “set aol as your default internet program” DO you know what to do? My contract is up with Gateway…Thanks. Warning – contains some bad advice. Regular cleaning of the registry will do virtually nothing for performance. In the hands of an inxperienced user a registry cleaner can be dangerous. There is no way a program can reliably determine if a registry entry is safe to delete. Windows does not reserve any portion of bandwidth as described. This is a rather well known myth. The descriptions of these services provided by Microsoft is NOT complete, they do more than stated. Stopping any of the above services can have serious consequences. The saving in resources are very small. Most experts would agree that you CAN disable the pagefile with 1GB of RAM. But that doesn’t mean it is a good idea. The pagefile is not merely a means of avoiding out of memory errors. The pagefile was designed to improve performance. The site is not mine but I highly recommend it. Service Pack 3 ? It sure would be nice if Microsoft could come out with an operating system that doesn’t have a bunch of holes that constantly need patching. By the time they get finished it will be as large and as much of a ram hog as Vista. They did the same thing to Windows 2000 Pro. I guess they figure if they irritate XP users enough with screw-ups like SP3, that we will be more than happy to pay some extra money and upgrade to another bunch of problems known as Vista. When is Vista SP2 due out? I used the chkdsk command in the run box and I believe that it kept me from running defrag. It would tell me somethink like the drive was busy. I think that GOD fixed this, as things are back to normal. chkdsk magically ran one day when I booted up. I booted up many times before as I was told to do by instructions in DOS. It did not happen. It would appear that the correct command to use in the run box is chkdsk /f. I have XP ho(me). Dell. 80G. 512RAM. I am a competent computer user. Completed coursework for the MCSE, but never took the exams. SP3 was and is a problem. Not for everyone, but for enough people to indicate that the release was poorly written and not satisfactorily tested. Whether you are an advanced computer whiz or a complete novice, a recommended patch from a major software operating system manufacturer should work. Period. End of discussion. The fact that so many people are having trouble with it over such a wide variety of platforms is an indication that Microsoft #$%lk))! the whole thing up. The IT guys at the office, all rather gifted, are avoiding it like the plague. They are also firmly in the “We’ve tried Vista and we’re not touching it with a mile-long pole,” camp. Perhaps they are biased. They did give me (marketing director) and my marketing specialists a pair of IMacs, which we may be giving up because they certainly have some marked shortcomings as well. I tried SP3 and got stuck with and endless restart cycle. My fault? Pretty sure it’s not. So to suggest that the numerous issues with SP3 are somehow all conclusively user-based errors is simply silly. Ok folks, here’s another one I need help with. I disabled the Task Scheduler and realized that my Webroot Spyware scan (daily)was negatively effected. First I tried to “Activate” from the Webroot program and it didn’t work. Next,I went back in (servicesmsc)and enabled Task Scheduler – nothing. Task Scheduler is enabled but my Webroot Spyware is not acknowledging this. Thanx. I’m slowly learning all this stuff. Fun, but frustrating. The last real problem I had was a malware problem. I used MS malware removal tool to get rid of it. Anyway, it seems I can’t visit your site without learning. I am fully aware of the “multiplicity of problems caused by SP3.” The AMD problem was caused by HP installing an image of the OS made from an Intel based system. My guess is most of the other problems have been caused by people not taking proper care of their computers, or screwing around with them in some way, not the service pack. I have been building and repairing computers for nearly 10 years now and almost all of the problems I have had to repair involved user error. If my car dies because I didn’t maintain it I have no one to blame but myself. There is nothing wrong with the service pack. In fact, as others here have noted, the computers I have installed it on are performing even better than they were before the upgrade. I installed XPsp3 on my PC with no problems even in beta form. Until about a week ago when my PC wouldn’t boot up. It would get as far as the XP splash screen then reboot again. Not sure if it was XPsp3 problem but 45 minutes with Microsoft tier lvel 2 tech got it fixed. This is my first PC that I built so I thought it was something else at first. It was something in the registry that became corrupt somehow. But the PC is running fine now. 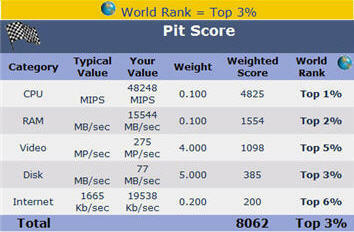 I use pcpitstop optimize and overdrive regularly. Thanks for the great products and services. All of us, newbies and pro’s alike, know that audio files take up a lot of memory and if they are associated with start-up and shutdown, they are ipso-facto bound to slow those processes up. One of the best tweaks i have come across is to go to control panel–sounds and audio devices–sounds, and from the drop down sound schemes menu, to select the ‘no sounds’ scheme, you can shave about 30 seconds from your boot time this way. First of all I just want to tell you that I really appreciate all the free info on this site and recommend it to everyone I know!!! I have a dinosaur of a computer HP Pavilion (2000). I just finished with #7 “Defrag your hard drive” and after running Disk MD, learned that I have only 22% available space on my hard drive. Turns out my restore system is responsible for my computer’s painfully slow speed. I don’t have the money to pay for Disk MD to clean up my hard drive so I hoped that doing the other tweaks would make a difference – it did but only freed up an additional 3% of space. Is there a way that I can manually get rid of the 10,000,000,000+ files of restored memory myself?? I followed the directions for tip #6. Instead of removing MSN Explorer which I left checked, it removed everything that was left unchecked. I admit to being a bit leery before I hit Next and OK but I did it anyway. What happened next was that all the other programs went away. No more Internet Explorer, Outlook Express, etc. I was sick thinking that I might have lost everything in those programs. I was relieved when I reinstalled the Windows components via the Windows XP CD and everything came back. These are great ideas but be careful as the steps may not be correct. Mine is a Wolfdale 8400 CPU 3000gigs OC’d to 4000gigs and memory from 800megs to 1068 amd FDB from 1333 to 1780. After installing a new EVGA video card I started getting occasional BSODs, so thought it was the card. Long story short, I got a notice about MS’ Live OneCare and decided to give it a try. First thing it did was want to get rid of Norton and I let it do so. It installed with a BS, but for all I know it was Norton doing one last convulsion. Anyway, once OneCare was up and running it never got above “Fair” in decribing my system status and told me I needed to update to IE7 and install SP3. I resisted for some time due to all the horror stories I had heard and even emailed MS’ tech support for OneCare about my fear of SP3. They told me if I didn’t want to do the upgrades the program would never go green, but if I went ahead they would provide any support I needed if I had any trouble with the SP3 install. This is not my first occasion to have problems with an install with Norton on my machine. I needed to update some drivers (I forget if MB or video) and tech support told me to do so in Safe Mode — no doubt to take Norton out of the mix. Then too, there is no way to know just how damaging to proper Windows operation the proprietary versions of Windows are that are installed by these computer manufacturers. A tech I once had occasion to chat with via email made the remark that all his relatives’ systems have had stand-alone copies of Windows installed instead of the ones supplied by the computer manufacturers and what a difference it made in their operation! My first experience with MS was when I had my first ‘puter (IBM) and bought a retail copy of Win98 upgrade. I went through eight hours on the phone with MS and got to level three on the tech food chain and the only way the last tech could make it install was to completely wipe out anything IBM had put on there and start with a clean slate. He got C/S to issue me a new license key that changed my upgrade disk to a stand-alone Win98 install. I was a newbie then and don’t know what all we did, but he may have even gotten me to wipe out the old BIOS and install a new copy, because we had to do something just to get the system to recognize the CD drive. Say what you will about Microsoft, and believe me I have done my share of cussing in their direction, but I can’t remember even one person I have had to deal with there who was anything but nice and as helpful as someone could possibly be. PC Pitstop has been great for years now helping everyone find ways to maintain their computers. I have been speeding up computers for years and all of my 8 pc’s are always running great. I havenâ€™t even gone through their list of 25 yet but I am sure I have been doing many of them already. I can say I do agree with if itâ€™s not broke, donâ€™t fix it. But after reading all of the past replies I am still not ready to install SP3. I wont even install IE7 which is much slower than 6. Thanks PC Pitstop for the years of great advice. Iâ€™m happy to send absolutely everyone to your site! For those with problems updating after XP SP3: I found I needed to force a Windows Update Agent re-install and this fixed the issue. I have been running SP3 since it was released to the public on 5 machines and this was the only issue I have encountered so far. The file needed to do this was WindowsUpdateAgent30-x86.exe. I downloaded this from Microsoft, put it in my C: drive. Once you have it click Start-Run, type cmd in the run field and when you get the command prompt type c:WindowsUpdateAgent30-x86.exe /wuforce this will force a re-install of the Windows Update Agent. If all goes well your updates should return to “normal”. This has worked fine for me but do this at your own risk. having no trouble w/ sp3 either, built my own (and I’m a total novice) amd 64×2, dfi board, xp pro … fingers crossed! I have 2 laptops, 1 gateway & 1 HP, both intel processors. I have downloaded & installed sp3 with no trouble at all. Has not effected either of them. Also downloaded it on my desktop/Built by me with an amd x2 6400 with win xp home on all 3, I have had zilch problems with either one & do appreciate all that pcpitstop has offered here on xp tips & tweaks. Most have helped . Still working on the rest of them. Thanks again. No brag, just consider myself as an intermediate pc guy. on several older PCs there is a jumper near the BIOS chip that you need to set to clear the BIOS. You can find a blueprint of almost any MoBo online to see if yours has one. If that doesn’t clear your BIOS, disconnect the battery for at least a couple of hours. Some of the older boards also have a low voltage capacitor that can sustain the BIOS for quite a while after the battery is gone. The QOS tweak is incorrect. By default 100% of bandwidth is available. The author advises disabling unneeded services, but only if you know what they do. Unfortunately he did not take his own advice. The Task Scheduler does more than schedule tasks for the user, the system itself uses it for a number of important purposes. If not set to Automatic the prefetch system will be crippled and both boot and application launch times will be impaired. Am I the first to notice that your impressive Top 3% score sheet refers to hardware speed? Would any of these software twaeks affect hardware speed? I appreciate your list, did know about and peform many of them already, and am working through the rest of it now. Overdrive puts my computer in the bottom 17% at this point. Let’s see if it scores better after the tweaks. Note: It gave me a 22% fragmentation test result, but it was only 10% fragmented when I ran the Windows tool. Are they measuring the same thing? I have a desk top and a laptop and both were given to me. Problem is that they both have windows NT 4.0 and both are password protected. The BIOS is also protected with a password and I can’t take the PW out and it won’t let me go any further. I would like to know how I could remove these passwords so that I could install windows XP pro and use the computers? I tried removing the CMOS battery but it’s not working. HELP! Good stuff, but maybe for all users without experience, the best one could be, If your PC is running good let it that way. And don’t do a thing if you do not know what are you doing. SP-3 Work great for me and installed in more than 100 PC and Laptops without any problems. First and foremost, I want thank PC PITSTOP for all their ‘free help and advise’ they have provided to PC users for several years that I personally know of and especially the 25 tweaks for XP. I obviously must be a lucky XP-SP3 user. I installed it on 2 computers, Dell desktop, XPS-410 (2007) and a Toshiba M45 (2005)laptop and both have worked without any known problems and no slowdown that I can detect. I did the installation when SP3 first came out, before my “auto update’ picked up on it. Some of the problems may in fact be SP3, but I’ll bet a whole bunch of them are operator errors as well…. not to mention all the different ‘brands’ of computers as well as home/local built units, all configured in an infinite number of ways. I also suspect that some of the problems experienced with SP3 may have been brought about by the particular computer configuration running at the time of installation???? I’m certainly just a novice when it comes to computers, so I do try to follow installation instructions carefully, such as closing ‘all running programs’ before starting the installation…. Great article. I’m glad for the users that have not had problems with SP3, but the evidence is out there that issues were caused by its installation. don’t know whether this is a sure-fire way to find out what is loaded, but if you right-click on ‘my computer’ > ‘properties’…should say sp3 if loaded..as opposed to sp2? For those having trouble getting updates after Windows XP SP3, you should read these 2 articles. The solutions in those articles worked for me at least, so they might work for you. Let me add a “couple” more things that serious readers would want to know relative to my previously stated findings: 1). I run Windows XP – Home Edition. It does have SP3 and I did download with absolutely no problems. I’ll grant you that my computer is really is in “tip-top” shape relative to having kept it current with all of the software I’m running, including “ancient” programs like Office 2000. 2). This is an “old” machine, Micron Millennia Max, upgraded to a 1.4 GHz Tualatin, most recent BIOS available, and 1.5 GB of RAM. 3). I regularly run PC Pitstop’s Optimize V2.0 and the most recent version of CCleaner. Both are invaluable programs for keeping the registry cleaned up and the Internet running at peak performance. Thanks to the crew at PC Pitstop for all of their informative articles and their products I’ve found to be of immeasurable value. Keep ’em coming!!! How can I be sure SP3 has not installed on my computer. It had rejected it in automatic updates. I don’t see it in the list of installed programs at least not as SP3. Am I looking for the right thing. My experience with SP3 has shown that IT IS buggy. The first bug to appear prevented Windows Update from installing updates. The updates downloaded but would not install. Also, some issues developed with Windows Installer and Windows Indexing. Using the scannow command, I discovered some corrupt system files. Since a clean install of XP was not an option, I was forced to seek help from MSFT tech support. After hours of getting bounced from one lame tech to another, a clever geek in India took ‘remote control’ of my PC and replaced the corrupt system files. That MSFT tech admitted SP3 had some issues that were being corrected. In the end, my XP SP3 PC is working fine, albeit slower. But, may I be condemned to H*e*l*l if I install it on my other PCs until next year…after MSFT gets SP3 right…maybe. Obviously you havnt had sp3 on your computers very long. I thought of a couple more changes for WinXP systems. In IE6 (don’t know about IE7)go to ,,privacy tab, adavanced and check “Over ride Automatic Cookie Handling”. Under “First Party Cookies”, check Accept. Check “Always allow session cookies”, and under “Third Party Cookies” check Block. Wow! I must be smarter than I thought. Your article is great and I have done all these changes/tweaks exceapt having no page file (I also have 2GB RAM), and stopping Task Scheduler since I run auto spy and AV scans. I have an AMD machine and did in fact try SP3 and the system would not boot afterwards! I got a BSOD with “ntdlr not found” or something like that. It seems to me that after reading all of these posts, by various skill level people, that we all should be able to see that some people have a solid grasp about what this article is about and then others do not even have a grasp about what Microsoft is about. This article made the assumption that you knew what you were doing in the first place working on your Windows installation but, sad to say, it appeared many that replied were clueless so we have to read their rants about their problems when they messed up what they were doing. I have worked on computers since 1971 and there are always problems but we live and learn so I hope these complainers will do likewise. Good luck and keep up the handy reminder articles. People who say “Windows XP SP3 Debacle?” with that “Deer in the headlights” look are either living in a cave or else use nothing on their PCs but MS products. We run a print shop. SP3 took out every major suite and program (Adobe and otherwise). It even took out the sound driver which refuses to restore. The only thing left standing was MS Office – it worked just fine. We are still recovering – thanks for the great tips, PC Pitstop! Handy article…Have been doing many tweaks already. I have had no problems with SP3 on three of my computers. Windows XP SP3 Debacle? Very few, if any, of the 25 suggestions have anything to do with SP3 and can/should be done on any installation of Windows XP… it also fails to list the TCP connection limit (event ID 4226) that should be patched so that a person can download more files simultaneously). I DON’T LIKE TO GO THRU ALL THIS STUFF, AND FIND OUT AT THE END THAT IT IS GOING TO COST ME A LOT OF MONEY TO FIX THE PROBLEMS THAT YOUR SOFTWARE FOUND. SO, BEFORE I DO THAT, PLEASE LET ME KNOW UP FRONT, HOW MUCH DOES THIS ALL COST???????? This article will come in handy. Although, I am probably going to keep my antivirus, ClamWin. I used to use avast free but I kept getting false positives. Other than that, it is a great AV. I also used to use AVG Free, but when AVG 8.0 Free came out, I heard it was crippling so I decided to switch. I also have multiple antispyware programs installed because one of them may find an infection that the others won’t. One thing you did not mention though was a good firewall. I use Comodo. I’m thinking of learning linux. Windows may be easier to use, but it is prone to errors and is not as secure as Linux. OPENSOURCE ROCKS!!! I’ve just finished a clean install.My PC wouldn’t even go fopr the system restore, I ended up with at last count 51 infections, talk about wanting to scream. I went thru th one-at-atime upgrade before. The tens of thousands updates and hotfixes, this time after reinstalling xp1; I went straight to the xp3. Not so much garbage as before,my machine is alittle outdated and I don’t have that much memory floating around ;that’s why opted to do it the short method. So far so good, it’s running faster and I’m on top of the cleaning, and not downloading so much junk. Figure If I don’t use it I don’t need it. And Thank You so much for putting that list up,I had forgotten a few of the in-b-tween steps. So glad there’s someone out there thinking about us idiotsand so know-it-alls. Again thank you. Well, I followed your instructions under “Remove Unused Windows Components” and removed MSN Explorer and lost my Outlook Express. Good thing I created a system restore point 1st. Please advise, is this normal? I installed SP3 on my 2 month old Dell computer. After install, computer would not restart. Could not even get it to start in safe mode. After about 8 hours on phone with Dell, with several technicians, I was told I hold to reload XP. I took computer to local repair guy. After 2 days and $250, got computer running again without reloading XP or losing any of my files. So some people do have problems with XP. I was current with all other updates previous to SP3. I will not be installing SP3 again any time soon. Don’t forget Java temp files. I play Pogo and this file becomes enormous. I also suggest BootVis. It reorganizes your start up to be faster. It is a free tool that I run about once a month; takes a while to run it thru 5 restarts. SP3 would not install on either of my machines……it stalled part way through the install on both of them….in different parts of the install. At the time I was not happy but as more and more stories of problems surfaced I was happy with the failures. I do most of the tips you listed weekly, use Optimize also. But for you to take the time and give the tips with instructions I think is great. Will wait for a later date to reinstall SP3. Before you reinstall SP3, try installing just the MS security updates, one at a time. Also, don’t install updates for Office 2007 (constantly offered) if you are running MS Office 2003. Don’t install updates for anything you have not activated, such as MSnet, instant messaging, etc. There is no Privacy to check other then then clear private data. There is no check to accept cooiies, nor is there a keep until I close Firefox. Please advise where these are found. The only problem I see is with SP3 is that I am constantly reminded that there are 3 windows install for MS Office and MS Works. All the programs for SP3 installed but I am always being told that I have an unsuccessful install for MS Works and Office. I uninstalled SP3 in the safe mode and that seemed to take care of the Office and Works. I went into windows upgrade and it did show that there was the security fixes in SP3. I don’t want to be unprotected so once again I reinstalled SP3 and the same installation problems occured again with MS Office and Works. Thanks for the tips–I especially liked the one about QoS. (#13) However, I must tell you that I followed the suggestions in #15, and it screwed up my computer. In particular, I was using CreateRestorePt.vbs in my Startup, and it depends on one or more of the services you disable. Luckily, I had not disabled System Restore, so I restored my system with no problem. I suggest that you need to check the “Dependencies” tab for each service before disabling it. I already do much of the maintenance recommended, etc., but I am grateful for the tips that I did not know about. I had a disastrous experience with MS Office SP3 (perhaps because had not installed XP SP3) and after that I decided to install all the previously disregarded MS updates that applied to my machine, very gradually. Based on advice from a trusted source, I finally bit the bullet and with shaking hands actually installed SP3. I have to confess that my machine (a 3-yr old powerspec with Intel(R)Pentium(R)D 2.80GHz & 3G RAM) actually runs better since. But anyway I think the lesson we all need to be reminded of is that a little maintenance goes a long ways towards happy computing. And good one Dave, a sense of humour also goes a long ways. And props to PCPitstop and anyone that takes the time to give this information to us. Thank You! the SP3 update works just fine and I have installed it on 9 of my family PCs, as far as the tips go I already use most of them so THANKYOU for them. According to this Microsoft link, the QoS setting discussed in this article will not have an effect on one’s usable bandwidth (that is, will not increase one’s usable bandwidth). I am not an expert, but I think that this “tweak” is not a valid one. But, I do appreciate the other “tweaks” in helping speed-up our computing! Thanks for all the tips.most of them i already had set.not everyone has had trouble with sp3.it has worked fine on my amd and intel computers. I was going thru the checklist and performing each operation. Well, I lost My Windows Explorer. I had to do a system restore. It happened after I cleaned the registry with your recommended free utility, and I had also removed msn explorer. Call me a total idiot, is msn explorer the SAME as windows explorer? Is that a yes….wish they would just call these things by the same name. It matters not what any of you whiners have to complain about…If you already know everything why did you even read these tips!!! How awesome that this kind of info is available. Compiling this list of tips took time and valuable effort and how anyone can find serious fault with it is beyond me. I thank you Shogun and PC Pitstop. Thanks for the tips there are only a few that Ihavent done. Thanks for those few. Mr. Chapman, you obviously have no idea what you are talking about. My ISP provides an optimization program that is much smarter than you, and they regularly remind me how important it is for me to use it. For example, your #2 must be wrong, because my ISP’s optimizer ADDs things to my desktop (and pretty much every else they can stick their icons). And you have completely missed the most important optimization (according to my ISP’s program) which is to change my browser’s default page from the terribly inefficient “about:blank” to the ISP’s home page which is loaded with wonderful advertising and other junk. How can you dare to give all this useless advice, when I have my ISP taking care only of my best interests. Thanks to Belarc I discovered that I was not receiving Windows updates after installing SP3. Numerous visits to the updates site and direct to Microsoft support indicated that I was up to date. Belarc support advised me to uninstall and reinstall SP3. I spent a happy four hours doing this but then got all missing updates. I could have gone for months without knowing I was not getting updates. I had a worse experience on my Compaq laptop. It will not boot after SP3 was installed. I get told that NTDLR is missing and that is the end of the process. I have heard more flak over XP3 upgrade, I have installed it on both my machines with no problems at all. Could someone provide a list of issues to look for? Yes I am “looking for trouble”. I am on W. Chapmans side. I went and looked at what SP3 had to offer. I got tired of scrolling and seeing crap that had no business being installed on my computer. I practice most of the suggestions on a weekly basis. I have to with a family using the same terminal, it can get bloated very fast. Great article. I had already done most of these tweaks but the QOS tip is a good one. I like that one. A few of the others I had taken from Fred Langa’s LangaList articles, “10 ways to make Windows (95,98,XP,Vista, others) Run Faster.” Thanks for the great help. Most of the suggestions can be done with free utilities and you need not do them manually. Utilities like ‘ccleaner’. The paranoia over installed programs is unnecessary. They do not take up any memory unless you start them. Unless you are out of disk space there is almost no need. Using anti-spyware, anti-virus and other tools, while applicable to cleaning up infections are really part of good maintance, not so much cleanup. There are several free TCP/IP optimization tools that are better than your regedits. Running Hijack This and analyzing what is in there and why is a very good idea. Do it and then, once it is cleaned up keep a printed list, and mark the good ones safe, so you can easily spot new processes. Cleaning out the toolbars and browser plugins is a must. I do this with Hijack this, at least for the IE ones. This is a terrific set of guidelines. Thank you for taking the time and trouble to remind some of us of what we should be doing. I already use most of them but I hadnt heard of the QOS tip until now. I think the comment by R Chasin is both unfair and unreasonable and it goes to show he doesnt read too many of Shogans posts on this site. The previous post apparently is not aware of the multiplicity of problems caused by SP3. His limited experience is NOT representative of the many horror stories that have surfaced on the net. In any case, your 25 Super Tweaks article is of great value and certainly will be applicable to many who wish to improve their XP installation. As for Microsoft, their anti user arrogant mentality is precisely what one would expect from a monopoly. Since the XP SP3 debacle? What is wrong with you besides you obviously like to complain about anything MS. Win XP SP3 was an excellent upgrade. I have installed in on a half dozen computers all without any problems. My guess is that people who have had problems havn’t taken care of their computer like they should. I’m not necessarily a fan of MS but they make a good product. Quit whining.